The Forest Leafer opens up to the sky to collect sun and rain much like a budding plant, while other designs are focusing on using wind and other natural resources like dew to create a integrated transformation from the tropic rainforest to the SunRainForest of Abu Dhabi. The Leafers are build with the brandnew lightweight construction technology splineTEX, which is based on fibre reinforced plastic and appropriate for the realization of architectural double curved structures; the flexibility of the material allows production processes without moulds so that each Leafer can be designed and produced individually without increasing costs (mass customization instead of mass production). The revolutionary splineTEX was invented and developed by the applicants together with global partners to answer the strong demand for free shaped design technics. The Forest Leafer is the core plant of the SunRainForest and combines effective energy collection with unique artistic design. The Forest Leafer finally grows to overall heights 3 to 9 meters and always moves the head in two axis towards the sun to catch most of its valuable rays. In the rare case of rain, the Forest Leafer adjusts upwards to collect plenty of rare sweet water to regulate the mircroclima inside the SunRainForest. – The multi layer skin embeds flexible solar modules with wires through the veins. The full diameter of the leaf varies from 2 – 6 meters. 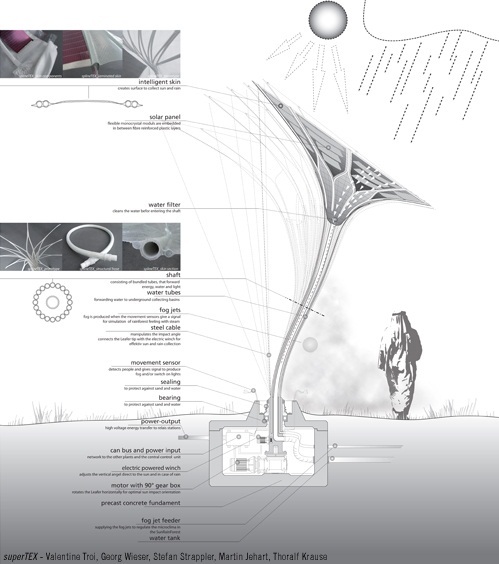 – The shaft connects the functional leaf with the solid basement in a flexible way (the shaft has similar characteristics like the pole for pole vault) to allow the horizontal and vertical movements to follow the sun. The shaft combines static and logistic requirements, such as forwarding of energy, water and light. – The root contains the intelligence to steer and control the ForestLeafer by connecting the individual Forest Leafer to the SunRainForest and its visitors by energy output and interactive systems. Intelligent natural parameters are defining the exact position of each different “plant” inside the SunRainForest to guarantee high effectiveness of diversified “plant” functions. Due to the proximity of the site to the airport, the design regards both – top view an the human eye view. – The Forest Leafers “grow” to different heights and leaf diameters according to its position and distance to each other throughout the whole area. – The wind collector plant is placed on the northwest streetside of the area to obtain the maximum wind energy.